Background to the project. 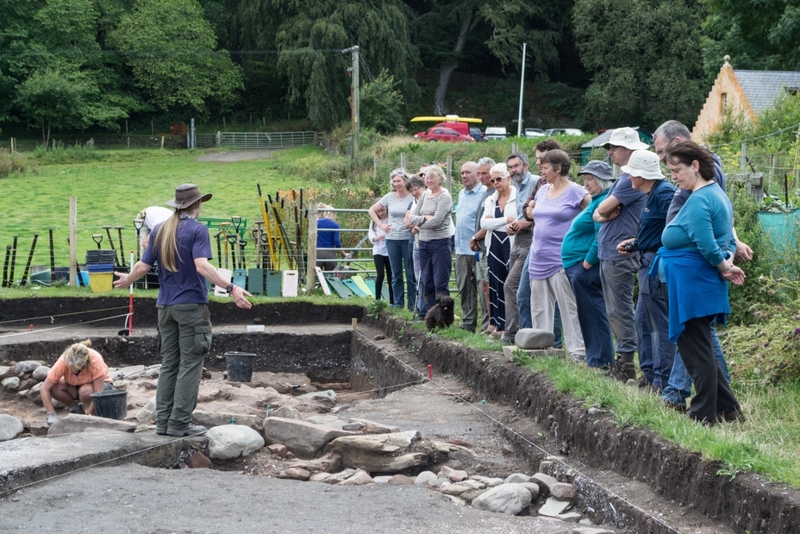 The Tarradale Archaeological Project started as a private initiative around 2008 and was incorporated as an approved NOSAS research project in 2011. 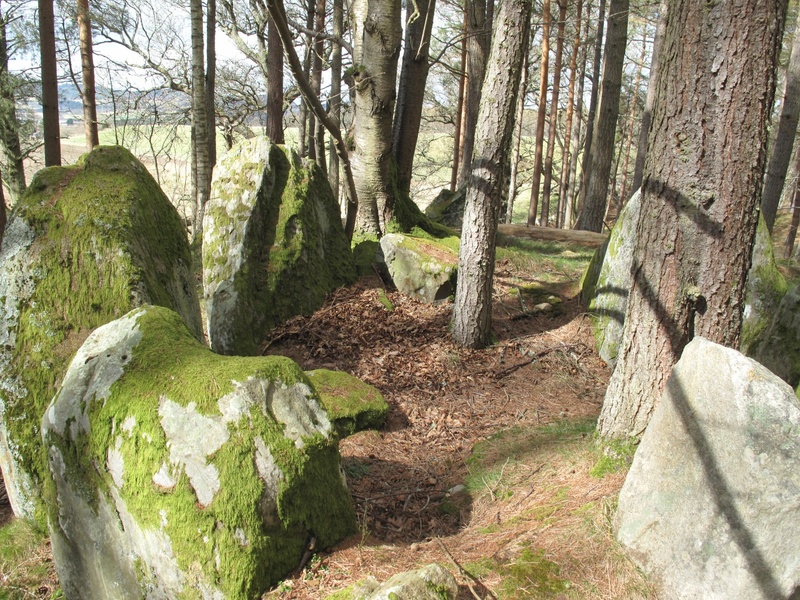 The Tarradale archaeological project aims to investigate and record the surviving archaeological evidence of the multi-period archaeological landscape of the Tarradale area and to interpret the chronological development of settlement and resource utilisation in the study area. The main activity of the project so far has been field walking which has been very successful and as data has been collected and analysed the parameters of the project have moved and the aims extended. Aerial photo of Tarradale area with Tarradale house in the foreground. Tarradale Castle (destroyed 1308) was probably located above and below the steep bank in the field immediately below Tarradale House. (Picture by courtesy of Jim Bone). 1. Location and extent of the Tarradale study area. 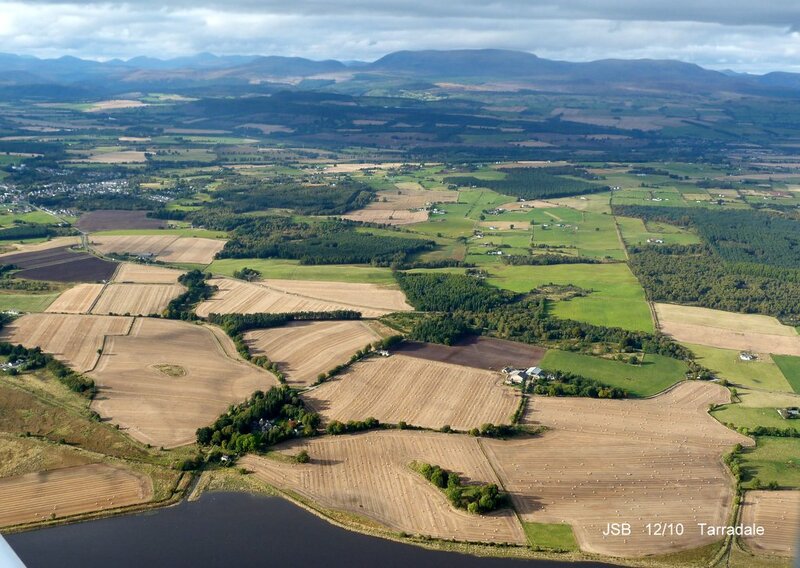 The study area comprises about 750 hectares of mainly agricultural land at the eastern end of the parish of Urray on the northern side of the inner Beauly Firth in Ross-shire. Historically the area was co-terminous with the old landholding unit of Tarradale estate and the ecclesiastical parish of Gilchrist or Tarradale, which was a separate parish until becoming amalgamated with the parish of Urray in the late 16th The historical centre of Tarradale was the old parish church, now surviving only as a mausoleum at Gilchrist. Following the building (or rebuilding) of Tarradale House in the 17th century, Tarradale House became the administrative centre (caput) of the estate. A large part of the area is raised estuarine beaches and that area today is flat or gently undulating high-quality agricultural land that is regularly ploughed. To the north of the former raised beaches the land rises towards the Mulbuie Ridge as undulating hillside mainly covered with boulder clay. Apart from Gilchrist Chapel and some standing stones probably erected in the Bronze Age, there are few visible archaeological monuments in the area that is intensively ploughed, although aerial photographs show cropmarks that can be interpreted as ring ditches, pits and enclosures. This contrasts with the more upland and less intensively cultivated area where there are standing monuments including Tarradale chambered cairn and an indeterminate feature which has been called a henge but is better referred to with the more general term of earthwork. This entry was posted in Black Isle, Bronze Age, General Archaeology, Iron Age, Medieval, Mesolithic, Neolithic, Post Medieval and tagged Archaeological dig, archaeology highlands, Barri Jones, Beauly Firth, Black Isle archaeology, Bronze Age Archaeology, Bronze age axe, Bronze Age barrows, Bronze age pottery, Chambered cairn, Copper alloy flat axe, Corded beaker, Craig na Caillich, David Aitken, Dr Kenneth Murchison, field walking, Gilchrist Chapel, iron age archaeology, Leaf arrowhead, lithics, medieval archaeology, medieval pottery, mesolithic archaeology, mesolithic hearth, mollusc shells, neolithic archaeology, North of Scotland Archaeological Society, NOSAS, pictish barrow, Pictish buildings, Pictish pottery, Post Medieval archaeology, post medieval ceramics, radiocarbon dates, raised beach, shell midden, Stone Axe, Tarradale, Tarradale Archaeological Project, Tarradale Castle, Tarradale Chambered Cairn, Tarradale HLF funding, Tarradale House, Tarradale Through Time, test pit, worked flint on January 6, 2016 by nosas. Our excavations in 2014 produced more informative data to assist with our research into the history of the Burgh of Cromarty including a more detailed picture of the layout and phasing of the buildings along each side of Thief’s Row, where our main excavation site is located (see a history of Thief’s Row) This includes the footings of three buildings shown on the 1880 Ordnance Survey map sheet on the north side of Thief’s Row, under which we identified the remains of another earlier structure, dating to the 18th century. At our limit of excavations on the north side of the road we uncovered three medieval structures with associated cobbled vennels and boundary walls – these have produced ceramics of 14th to 15th century date. One of these structures had been re-used during the 16th to early 18th centuries and the thickness of the clay-bonded walls would suggest it was at least a two-storey high building – most likely a merchant’s house. To the south side of Thief’s Row, our excavations uncovered extensive structures and deposits of medieval date (13th to 15th centuries) including stone buildings and more ephemeral wattle and daub structures, along with their associated boundary gullies, vennels and evidence for small-scale smithing, which will be investigated further in 2015. These areas of settlement and activity were abandoned relatively early in the settlement history of the burgh, the structures being landscaped over with spreads of ash, fish bone, animal bone and shellfish middens that were most likely generated from activities taking place on the north side of Thief’s Row and along the High Street to the west. In the latter stage of the 18th century, the south side of the road was then given over to small garden plots and eventually more open fields. This entry was posted in Black Isle, Excavations, Medieval, Post Medieval and tagged Archaeological dig, archaeology highlands, Black Isle archaelogy, context sheets, cromarty, Cromarty fishing industry, Cromarty Medieval Burgh, Derek Hall, highland archaeology, iron fish hooks, iron pot, John Haggerty, medieval archaeology, Medieval ceramics, medieval pottery, midden material, North of Scotland Archaeological Society, NOSAS, post medieval ceramics, quern stone, spindle whorl, stone disc net sinkers, wattle and daub on June 27, 2015 by nosas. The subterranean section of NOSAS, the Rosemarkie Caves Project (RCP), is planning more work in the caves this year (2015). 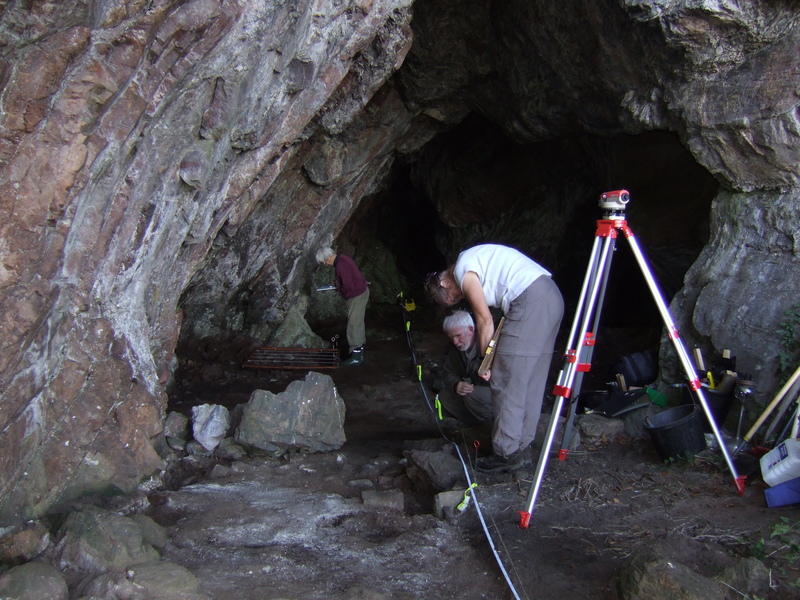 The RCP was set up to research the archaeology of the caves on the Moray Firth coast near Rosemarkie. 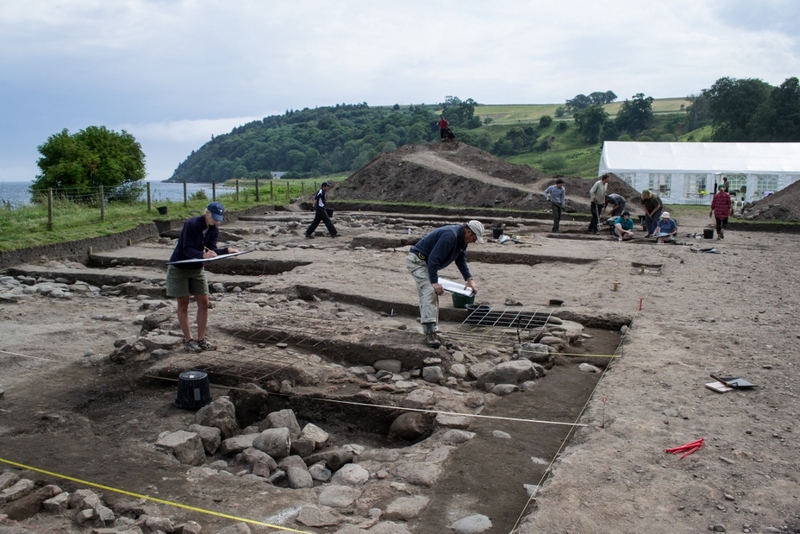 The group started its work in 2006 with a weekend excavation of Learnie 2B when evidence was found of occupation and leatherwork in the 19th century, probably by summer travellers. 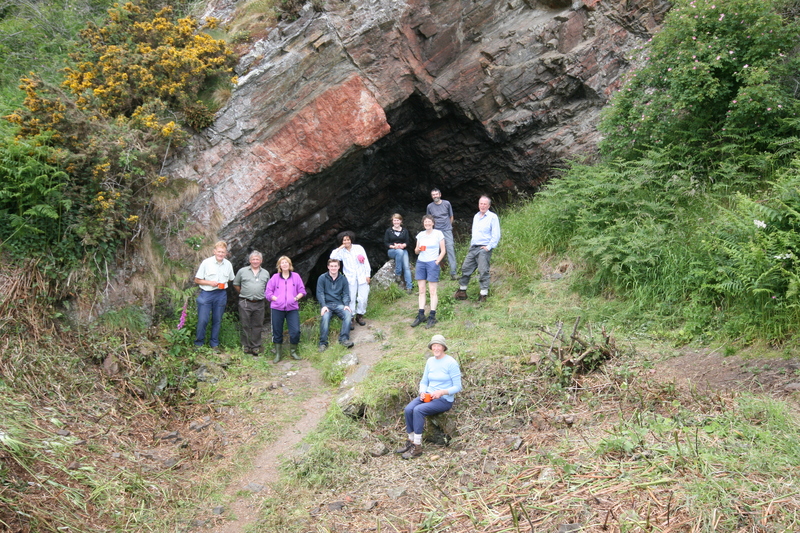 This was followed by a more ambitious 14 day dig at Cairds’ Cave in 2010, when we confirmed that the cave had been excavated 100 years before by local doctor William MacLean. Through analysis of bone and charcoal, the cave was found to have been in use as far back as 300BC, the time of Alexander the Great. There are 19 caves on this 2.5 mile stretch of coastline, they have been high and dry for over 4000 years and apart from interest by RCP and Dr MacLean, their archaeological potential has never been explored. Since 2010, the RCP members have surveyed all 19 caves and then in 2013 started a program of test-pitting. The purpose of this was to get a feel for the archaeology that might be there, but mainly to find deep samples of bone and charcoal for dating which would ascertain in which periods the caves were used and to find out, if possible, the earliest occupation. This entry was posted in Black Isle, Excavations, Iron Age, Medieval, Pictish, Post Medieval and tagged Archaeological dig, archaeology highlands, archaeology Scotland, Black Isle archaeology, cave archaeology, cave excavation, current archaeology, Doctor William Maclean, highland archaeology, incised stone, iron age archaeology, Learnie caves, medieval pottery, North of Scotland Archaeological Society, NOSAS, Pictish, picts, Post Medieval archaeology, radiocarbon dates, Rosemarkie Caves Project, Scottish archaeology, test pit on April 20, 2015 by nosas.